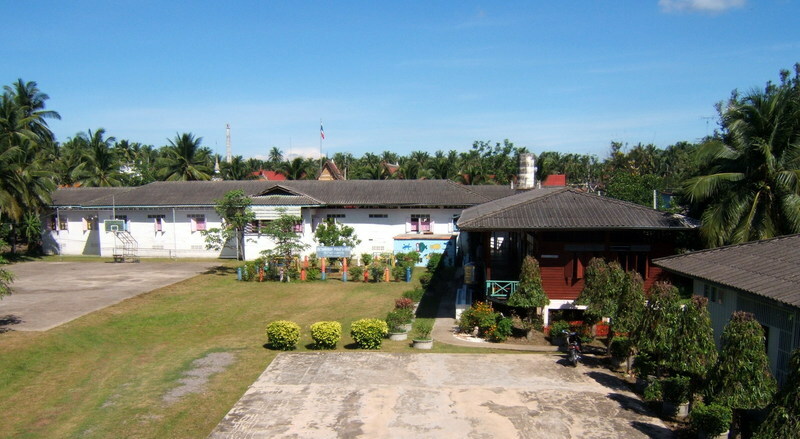 Above: Bankhonthiinai School, situated amidst banana and coconut plantations and across a small khlong from the local temple. 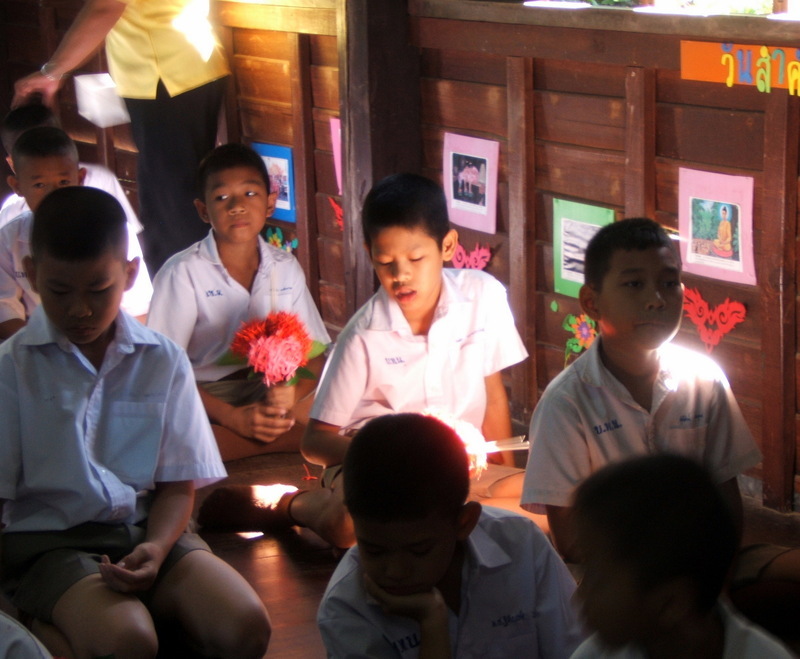 In Thailand, teachers are highly revered. This is reflected in the annual Piitii Wai Khruu or “teacher respect ceremony”. The word wai is both a noun and a verb, describing the prayer-like greeting Thais use as well as the action of paying respect to someone, usually by making the prayer-like gesture and/or also kneeling down before them, touching your palms together in front of your face, then bowing down until your palms and forehead touch the floor. Wan Wai Khruu (wan = day) is held near the beginning of the academic year and is always a Thursday, the day associated with teachers. Ajarn Yai specifically requested that Kobfa and I bring Ken and Markus with us, as they both have been to the school several times. 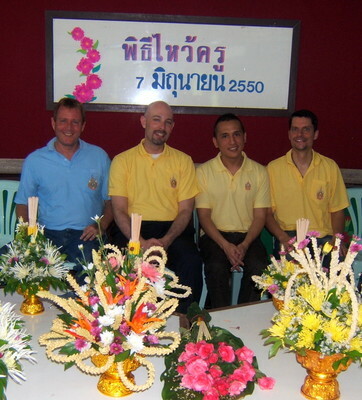 Right: Ken, Chris, Kobfa and Markus. I’m afraid I may have hurt some feelings by not inviting other people who are interested in going to the school. We had only four places in the car and as English instruction doesn’t begin until next week, it was better to wait. It was very nice to get back to Bangkhonthiinai. Kobfa and I were remarking on the changes that various students went through in the three months since we last saw them. Tanawat, a little second grader, has gained so much weight. Wuttichai, already slender, grew several inches and now looks like a chopstick. The children entering grade six have grown more mature: Sulaliwan and Wisit, in particular, are both starting too look like young adults rather than children. The students were happy to see us. Most were pretty shy about using their English. I spent a little time speaking with them in small groups and I think they were excited to see that they still remembered quite a lot. Left: Friends reunited after summer break. We stopped by the English room and were surprised by the changes there, too! After a trip to a technical college in Hua Hin that has an advanced program in TV production and broadcasts lessons throughout the country by satellite, Ajarn Yai decided she wanted that technology for her school, too. A few proposals later, the school now has a digital projector and two computer workstations set up in the English classroom. A satellite dish will be next, I’m sure. Now I have to figure out how we can incorporate technology into the classroom. Before describing the ceremony, I’ll note that Ajarn Yai explained that while smaller schools usually don’t do this elaborate a ceremony, she tried to incorporate as much of the full ceremony as possible for our benefit. The ceremony began about 9:30 with all the students seated in one of the larger classrooms (tight fit) with a monk from the neighboring temple presiding over affairs and all the teachers seated along the front of the room. The students sat in rows, each with a small bundle of flowers, incense, and candles. Additionally, there were a few dozen larger floral arrangements. Below: Waiting for the ceremony to begin. The flower arrangements represented group efforts, everyone having a role to play in making them. Quite often at larger schools, this will be a competition between groups or grades. In this case – everyone’s a winner at our school – there was no competition. The student body presidents – a boy and girl in sixth grade who were elected at the end of the last year by the general student population – began the ceremony by wai’ing the monk and then lighting candles and paying respect to the Buddha image set up in the room. Once seated at the front of the room, they read some prepared statements and chanted. 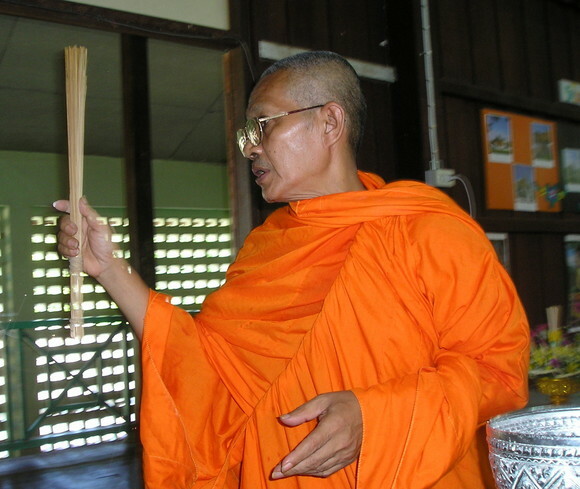 The chanting, part in the Pali language and part in Thai, ties into Buddhist liturgy. The gist of what was said was that the students want to honor and pay respect to their teachers who give them knowledge. Then, speaking on behalf of the entire student body, they promised to study hard, pay attention, and learn a lot this year. Students came forward in pairs, beginning with the youngest children, to present the floral arrangements. With the younger children (pre-school) this took quite a bit of instruction and guidance – “no, don’t kneel so close to the monk” and “wai first, then bow your forehead”. The students would wai the Buddha statue three times, then the monk three times, then kneel in front of Ajarn Yai, wai once and present the floral arrangements. These were then passed down the row of teachers so we could all “receive” them before they were placed on two tables. After the floral arrangements were presented, the students came up with their individual flowers for the teachers. There were ten teachers so ten students came up at a time, kneeled in front of the teachers, wai’d, then handed the teachers to us. Because Ajarn Yai is not publicity shy, we stopped at this point with each batch of students for a photo opportunity. 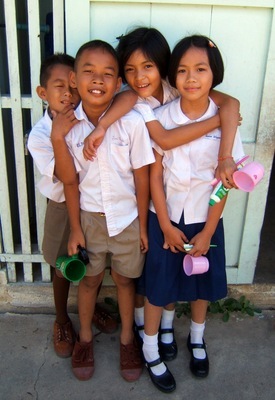 The most common flower for Wan Wai Khruu is dok kem – the needle flower. Just like the English expression, “as sharp as a tack”, dok kem is symbolic of sharp minds. There was also a lot of dok malik, jasmine, as well as dok gulap, roses. Right: In this picture, I’m holding a bunch of dok kem. Following the receipt of the flowers, the monk said a brief sermon, explaining to the students that teachers are only second to parents in importance in their life. 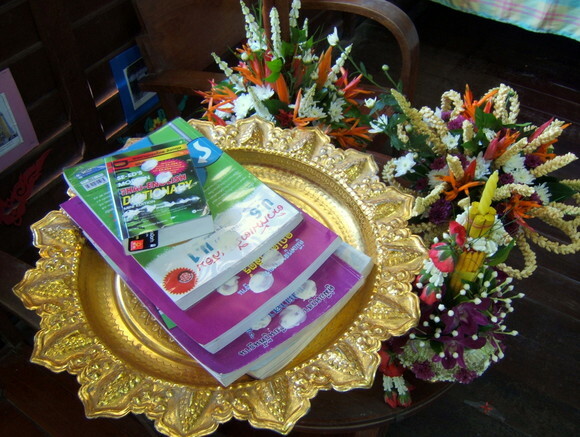 He then blessed the learning materials, marking (jum) four new textbooks (including a Thai-English dictionary – a good sign!) with white clay mixed with water. These are the same markings that you often see inside or at the entryway to a new building, or inside a vehicle. Finally, he proceeded to bless the students and teachers, giving us all a good spraying of holy water. Above: Interest wanes and the monk preaches. Below: Blessed textbooks. Above: The monk splashes the students with holy water. Below, in order to gain collective merit for the good deeds of two students who are feeing the monk, all of the other students touch each other in a move reminiscent of the “laying on of hands” withing certain Protestant Christian traditions. The teachers also had their chance to deliver blessing to the students along with whatever wisdom they wished to impart. Starting with Ajarn Yai and continuing down the row, we each took the microphone. When it was my turn, I asked in English who remembered their English. Long silence. Repeating the question in Thai, there was a better response. I went on to explain, in Thai, that this year we are going to study very hard and learn lots of English. Continuing, I reminded them that the way to learn is to practice every day: practice speaking English with their teachers and practice speaking English with each other. Right: Khruu Somchai and me. The microphone continued down the line, Kobfa translating for Markus and Ken, who each had nice things to say. There was a song that Ajarn Yai said the students were supposed to sing at the conclusion of the ceremony, but the students had not had time to practice since we had a late start to the school year. So things wrapped up after this and everyone went to the cafeteria for lunch. Another nice treat: one of our grduates from last May stopped by school. It was nice to talk with her and we learned that she passed some very tough competition to get into her prefered secondary school: out of 500 students applying for 200 positions, she ranked 19th. To top it off – and we can’t take all the credit for this as she’s an excellent student – she scored 100% in her English examination! Ploy is one of those students that will go very far in this life and Kobfa, Tawn and I have discussed how much we’d like to provide some help for her in the future, if she needs it in order to study at a good university or to study abroad. Since there was no instruction today, we left early, returning home by 4:00. Time to finish those lesson plans. Next Wednesday the real teaching begins! Wow! I really love the updates about the school. I loved the time I spent there in December. Such a great way to show respect and admiiration for teachers. Wouldn’t that be great here in the states. Not likely I’m afraid. It’s an amazing custom to pay such respect to teachers. I wish a mere fraction of that respect was paid out here. Computers and digital projectors!! Oh my! Start cranking up those PowerPoint slides!! You can also make your own videos and show them your life in Bangkok!